Here's some great news from our friends from Southeast Asia's Biggest outdoor superstore, R.O.X..
Ayala Land will be having an invitational trail running event on a newly established route this June 8, 2013. I just confirmed my participation and I hope to see you there! :) How to join? Browse below. Explorac Trail Run offers 11k and 22k rough terrain. Trail run will start at Ayala’s Visitor Center and will end at the Ayala Nature Park. The course has a flat to hilly terrain and majority of it is hard surface. The trail features wet/dry river bed, it not all, are heavily silted by mudflow due to Mt. Pinatubo eruption way back 1991 and succeeding lahar flows. In some areas, moderate steep climb will be experienced along the rough terrain portion and huge lahar track will potentially challenge your trail running skills. Opportunity like running under the SCTEX bridge and passing through beside waterfalls are a few of the scenery that the trail offers. Rise and Shine as your explore Porac through trail running. Visit R.O.X. Marquee or R.O.X. Bonifacio High Street to register. This is an INVITATIONAL RUN, no registration fee required. How to get to R.O.X. Bonifacio High Street? Directions here. 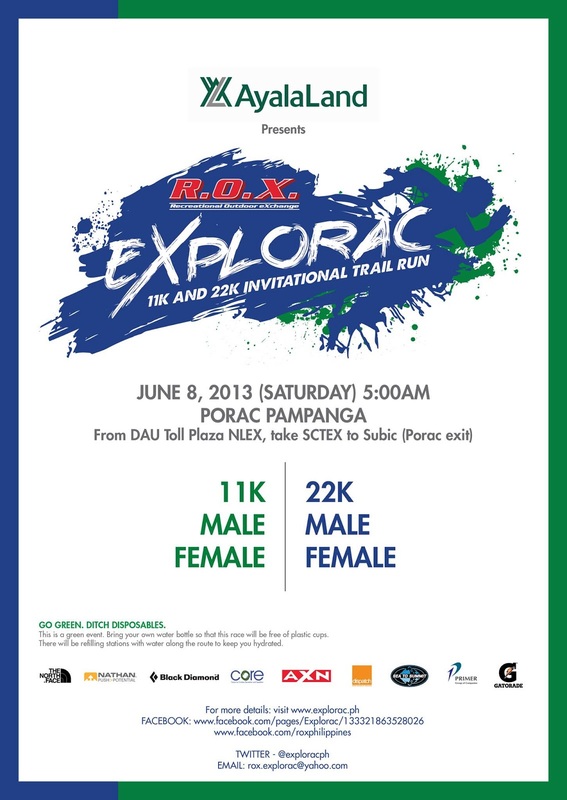 For further information about the race, please visit the event site, http://www.explorac.ph/ or like R.O.X. on Facebook and receive updates through their page. In connection to this event, a Trail Running 101 clinic will be held on June 4 in R.O.X., Bonifacio High Street. 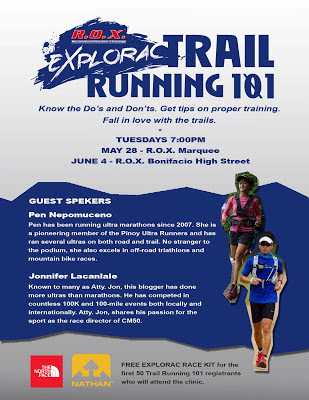 Speakers are ultra runner goddess Pen Nepumoceno and runner blogger, Atty. Jon Lacanlale of Ultra Running and Beyond. To join, just register through the event page. Click here.